Slow art isn’t a collection of aesthetic objects, as you might suppose; rather, it names a dynamic interaction between observer and observed. Artists can create the conditions for slow looking—think of James Turrell ’65 Skyspaces like Pomona’s “Dividing the Light.” But what about viewers? How can we do our share? In a given year, more Americans visit art museums than attend any one professional sporting event. They want and expect to take pleasure, learn and share positive experiences with each other and perhaps with their children. Too often the result is otherwise. Despite massive arts education programs, many visitors still arrive at a museum feeling confused or disadvantaged about how to navigate the place—where to go first, what to look at in any given gallery, how to connect with what they find. (There is a particular disconnect for people 40 and under, on whom museums will increasingly rely for support.) As a Jeffersonian populist, I believe that everyone who passes through a gallery ought to feel enfranchised. Everybody, I believe, can have meaningful, maybe even transforming experiences looking at artworks. Whether or not we possess any particular talent, training, art education or technical vocabulary, we all bring the sole necessary requirements: a set of eyes and lived experience. The playing field is level. But how to look is not self-evident. How? My answer will come as no surprise: pacing can make a world of difference. Magic may happen when you give yourself over to the process and attune yourself to the artwork, listen to what it asks from you. “Notice how with two or three lines I’ve made this thatched roof,” says a Rembrandt drawing. “Look at how the shadows under the plane trees turn purple,” says a Van Gogh landscape. Give a painting time to reveal itself, I’ve said, and it turns into a moving picture—the experience can be that eye-opening. Over time, you will perceive more and more elements of the image, things that you literally never saw before. However closely you attend, you will never absorb an object’s every visual detail or nuance. There will always remain more to see. In fact, this inexhaustibility is the sign of art itself. How, then, to slow down? There are many possibilities, old-fashioned (docent tours, audio guides) and newfangled (smartphone apps, iPads on gallery walls, online learning sources like the Khan Academy). The scores of museum-goers who use them testify to a widespread need for guidance. Each of these options may work. Here, I limit my suggestions to rugged individuals, unwired visitors who follow neither audio tour nor app. Or better, take advantage of any external aid—rent an audio tour because you know nothing about Mughal art—but take time also to shut off the devices and linger. 1 / Believe that you already come equipped with everything you need—those eyes and that life experience. Trust that something surprising can come of the encounter, or simply that the experience might be fun. 2 / Don’t go alone. In another’s company you’ll have more stamina and notice more. (More than three people looking together may prove too many.) Best is a viewing partner who is open-minded, prepared to be patient, receptive to being taken aback. Also, somebody you feel free to disagree with. “Opposition,” said William Blake, “is true friendship.” Some of my best experiences have come out of seeing things differently from my companion. 3 / Remember that museums are like libraries. Why do people assume that they need to look at everything on display in a gallery when they would never pull every book off a shelf? Be selective. Once I interviewed the Metropolitan Museum of Art’s longtime director, Philippe de Montebello. I asked him about navigating art spaces. “My wife loves going to museums with me because I tell her: ‘In this room, we will look at X and Z.’” “If we happen not to be your spouse?” I asked. “Head first to the museum shop. The postcards will tell you which works the place prizes most highly. Second, say you’re in a gallery with many objects clustered together and another given its own vitrine. Choose the latter. Finally, whatever the guards say, you have to get up close.” I would add: start by scanning the room to see if anything calls out to you. Don’t even think about pausing before every object. One or two items in a gallery will be enough or more than enough. Don’t worry if your pick is not among the postcards; trust your taste. 4 / Grant your chosen object time—how much is tricky, I acknow­ledge. If, after a spell, nothing clicks, move on. This is a no-fault game. You are nobody’s student; there are no should’s. Eventually you and your companion will find something that you agree is intriguing, striking, ravishing, perplexing, disturbingly unfamiliar—what that thing is hardly matters. 5 / Now let yourself go. Get close, back up, shift from side to side, squint. Notice the surround: does the installation lighting create hot or dark spots unrelated to the artwork? Let yourself wonder about what might seem trivial. Why do Cézanne’s tables tilt up? Why do mountains look stylized in medieval depictions of deserts? What is that strange detail on the curving side of a glass vase, in a still lifepainting of flowers? Might it be light reflected from a four-paned window in the imaginary room? And why is a caterpillar munching on that leaf? Why does one window in an Edward Hopper painting behave differently from its neighbors? There is no telling where seemingly naïve questions may carry you. Remember that frustration is part and parcel of engaged looking; an artwork that doesn’t offer resistance may not offer much at all. 6 / Let images “tell you” how they want to be seen. In my experience, they will do so if you “listen to them” with patience. 7 / Don’t be in a hurry to speak. Start by letting your eyes wander freely. Then zero in on what seems meaningful, or looks to be part of a pattern, or perhaps is an anomaly. Toggle between focused and unfocused looking. Test what you’ve registered by closing your eyes and asking yourself what you recollect. Then look again to compare. 8/ Don’t screw yourself to the spot. A surefire recipe for distraction is to insist that you concentrate on some work for X minutes. You are sure to chafe. Genuine viewing is always a mix of engagement and withdrawal, and as I’ve said, some degree of boredom is integral to the experience of slow art. 9 / Say you are looking at a Renaissance painting of a sallow-faced woman whose reading has been interrupted by a man with Technicolor wings. It’s enough to begin by attending to the physical details: the crisp folds of the red linen hanging behind the bed, or the mosaic pattern on the floor, which seems to repeat the design of a stained glass window in the recess at the left. Under the bedchamber’s barrel vault a half lunette appears to float above the bed canopy—like a moon, or the book’s open clasp. It’s good to begin in mystery, because not knowing rouses curiosity. Questions prompted by the act of looking motivate us to learn about the image’s content and about its social, aesthetic, political, historical contexts. By contrast, front-loading information—in a slide lecture sandwiched in with a hundred other images—is likely to generate little interest and leave but a fleeting impression. So studies of museum education repeatedly conclude. 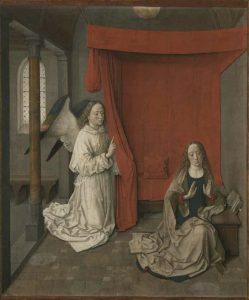 Now—and not before—is when the wall label should come into play: what Dieric Bouts painted between 1450 and 1455 is the Annunciation. Wondering what that refers to—I am assuming no specialized knowledge—brings your smartphone app into the picture. You learn that the Angel Gabriel has just told the Virgin Mary—that is, he has announced—that she is to be the mother of God (Luke 1, 31). His message accounts for her expression, a mix of bashfulness (she refuses to return the angel’s gaze), shock, humility and fear that she will not satisfy the job requirements. 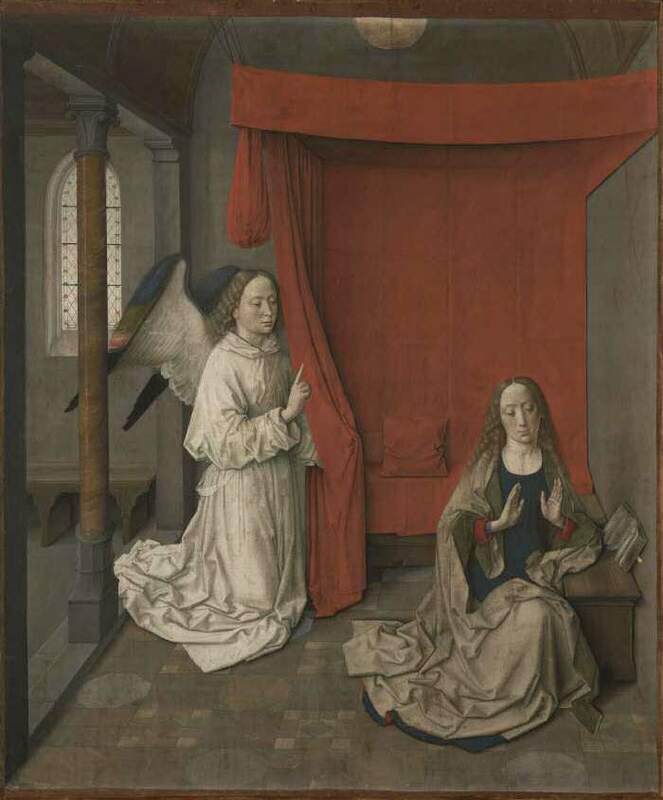 Perhaps Gabriel’s words also explain the placement of her hands, which simultaneously express astonishment and are about to meet in prayer. Pursuing your inquiry will teach you that the cloth bundled up at the left-hand corner—a gorgeous, realistic, seemingly gratuituous detail—also symbolizes the great event yet to unfold but already being prepared. This bundle is a visible, external double of Mary’s womb. But what of the single pillow propped up on the bed, square between Gabriel and Mary? Another symbol? On the Getty’s website you can see Bouts’ underdrawing, detect traces of animal glue seeping through the linen, and spot vermillion pigment, thanks to X-ray and ultraviolet analysis. Speed and distraction aside, there has never been a better time to look. 10 / You will get better with practice. You and your interlocutor will become comfortable with each other’s rhythms and styles. You will build up categories to scan for: color, composition, mood, atmosphere, form, depth, quality of brushstrokes—fine or broad, insistent or invisible; awkwardnesses, conventional narratives; stylistic changes over time; political controversies. Over time you will amass episodes of close looking and build a mental library of images, a backlog of aesthetic experiences that will serve as points of reference or comparison. 11 / You will experience a range of pleasures: eye-candy, puzzle-solving, meditative or spiritual moments. You will have fun. … she thought she’d somehow only now learned how to look. Arden Reed is the Arthur M. Dole and Fanny M. Dole Professor of English at Pomona College and author of the forthcoming book, Slow Art: The Experience of Looking, Sacred Images to James Turrell.